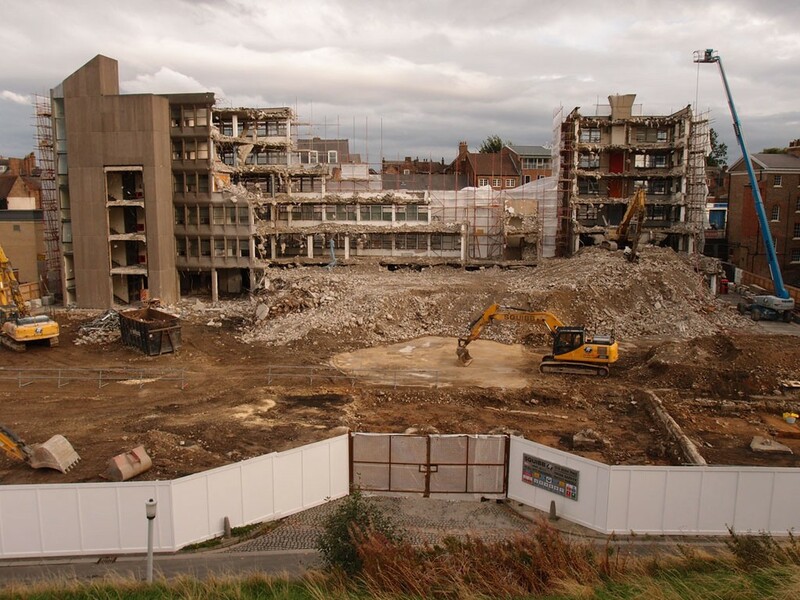 One of the most interesting changes in the city centre over recent months has been the demolition of Hudson House, an office block built by British Rail in the late 1960s, between Toft Green and the city walls. Hudson House was one of my ‘office block studies‘ a few years back. 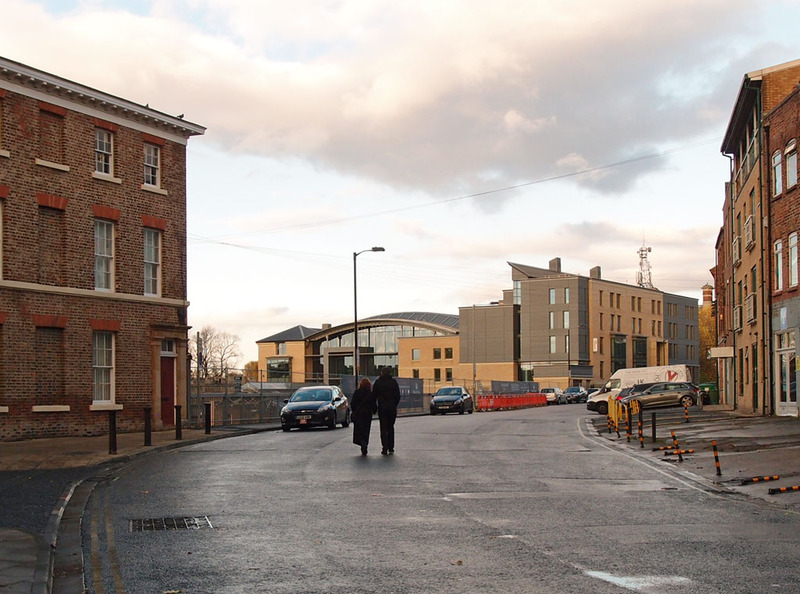 It looked for a time like it might be kept and converted to residential use, as many other office blocks of a similar period have been, but a later planning application was made for demolition and a complete new build on the site. 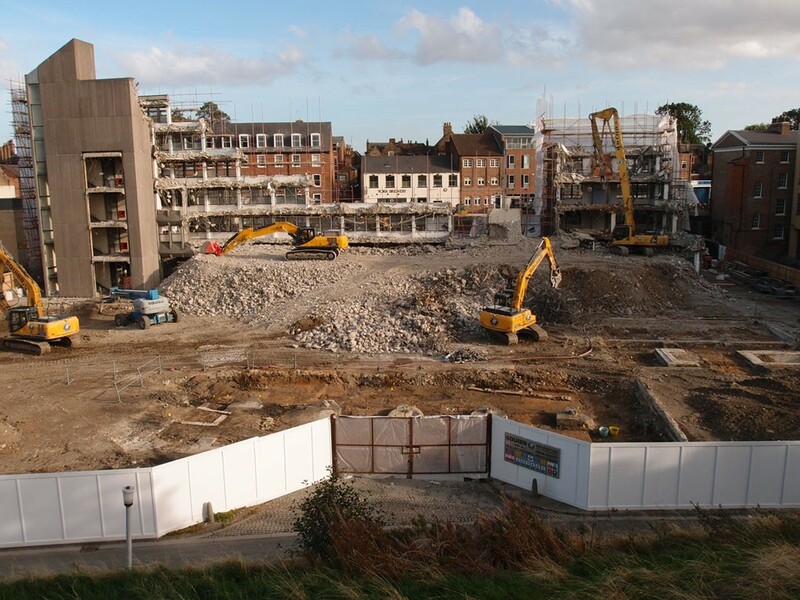 I went along to have a look at the demolition in progress many times over the summer and autumn months. 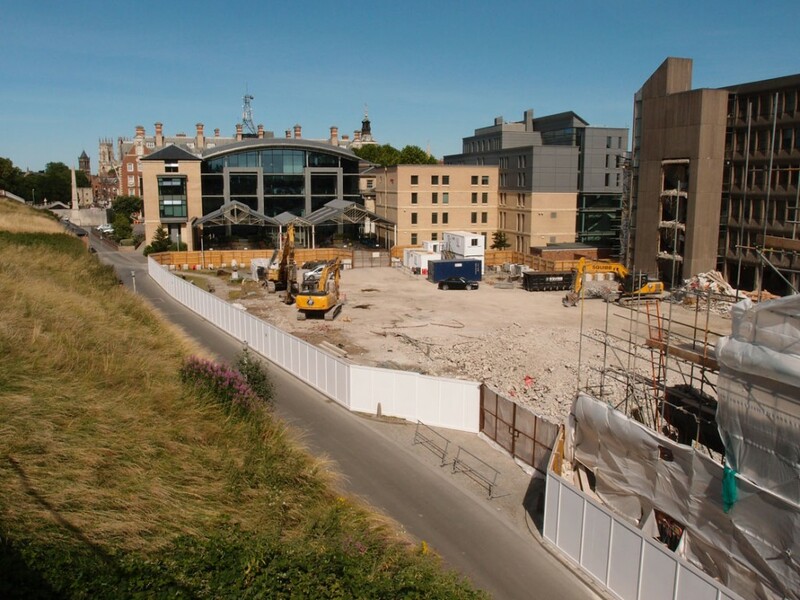 The walkway along the city walls gave a good view across the site, as the building was gradually reduced to piles of rubble and cleared from the landscape. 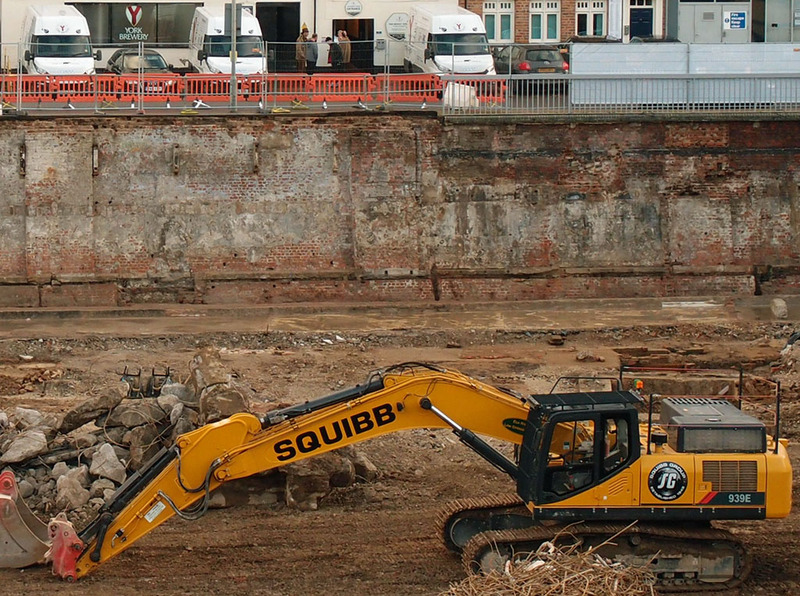 The removal of Hudson House has made it easier to appreciate and understand the site of the old station. As anyone interested in York’s history will probably know, York’s earlier railway station — opened in 1841 — was built in this area within the walls (replaced a few decades later by the station still in use, outside the walls). Part of the old railway station remains, the historic buildings incorporated in the recent redevelopment of West Offices. 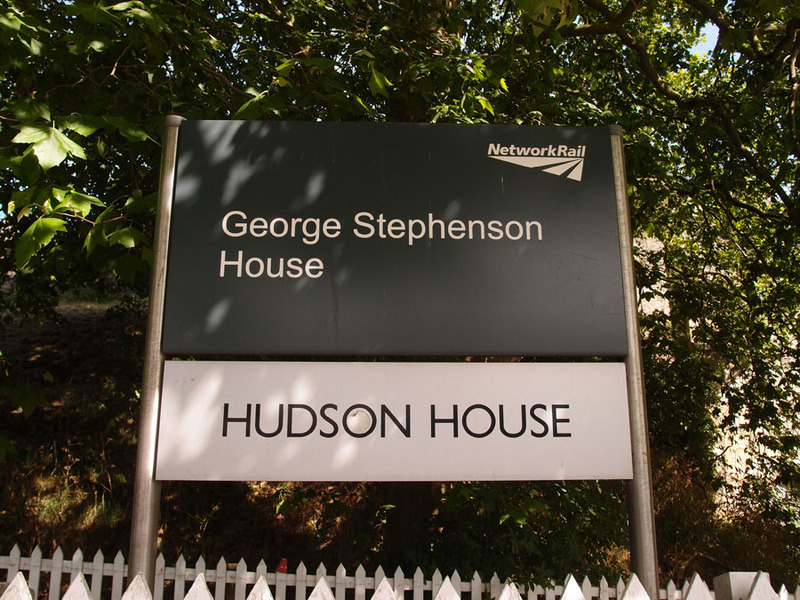 Hudson House was built in the late 1960s across the other part of the old station site. This old postcard image illustrates the area before Hudson House was built. We’re looking towards the city centre, the city walls are on the left and the white stone obelisk of the NER war memorial is a landmark just inside the city walls. 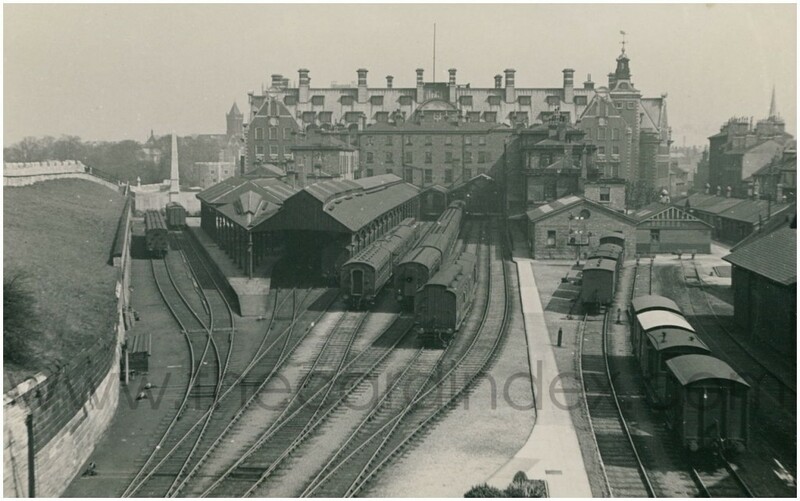 The old station apparently kept its railway lines and was used for carriage storage long after the ‘new’ station had replaced it. It took me a while to find a comparison view among the hundreds of photos I’ve taken of the site in recent months. Here’s one from August this year, from about the same place on the city walls, when much of the bulk of Hudson House had been cleared. 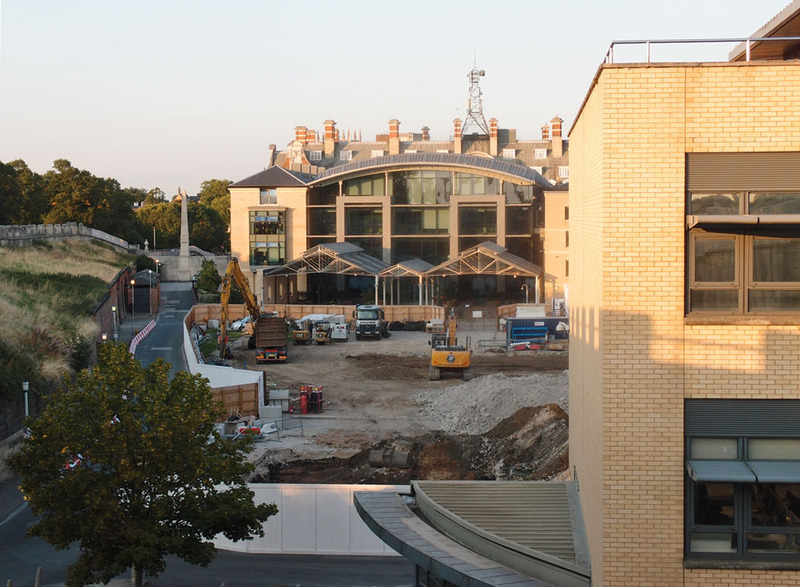 From this angle, the ‘old station’ looks very much 21st century, because of the recent additions to the original station building, in the West Offices redevelopment. In the foreground is another relatively new office building. Between them is where Hudson House used to be. Its clearance makes clearer the way the 21st century redevelopment of the old station/West Offices reflects the older building, still looking like it’s respecting the long-ago-removed railway lines and the orientation of the old station. It was more difficult to appreciate that when Hudson House was in the way. 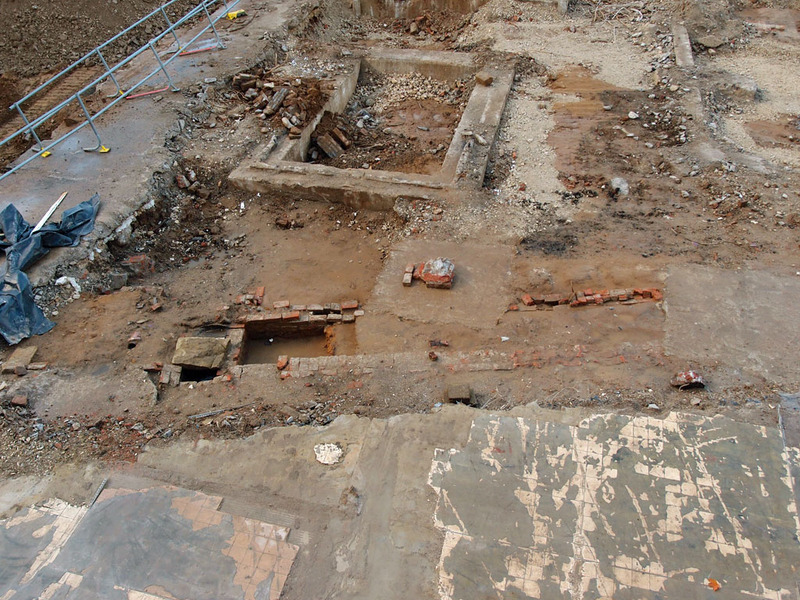 Here’s a reminder of how Hudson House occupied this piece of land inside the city walls. A bit of West Offices is visible behind it. 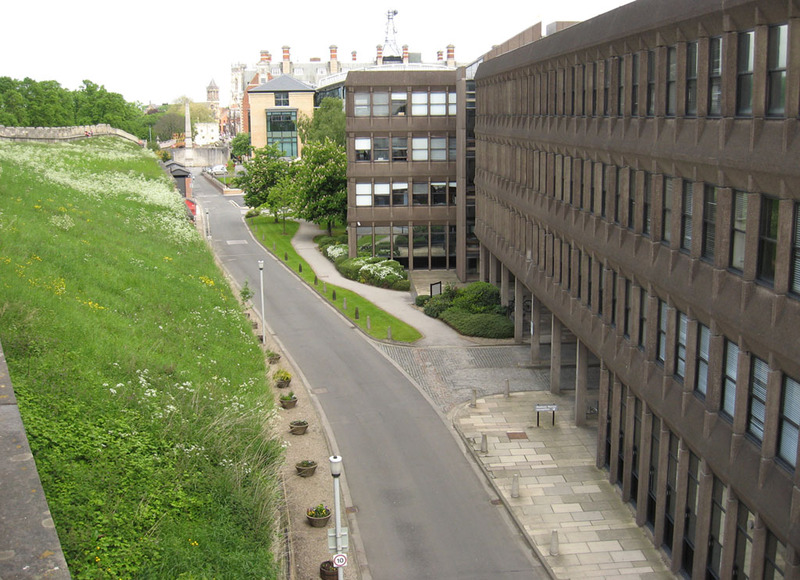 As in the previous two photos, the city walls and the NER war memorial are reference points, to the left. Hudson House was quite a dominant building, wasn’t it. Its demolition down to ground level has opened up again this area of land inside the city walls, where at one time the trains came in. Perhaps the most interesting comparison came from looking straight across the site from the city walls walkway towards Toft Green. After I’d wandered along here for a look a few times I realised that it would be sensible to take some photos from roughly the same point, as demolition progressed. An access gate in the hoardings around the demolition site was one of my reference points. 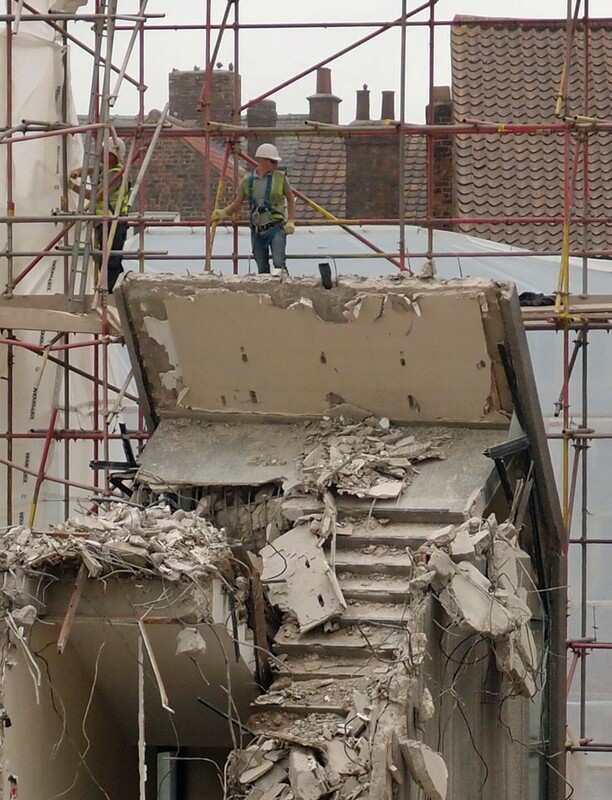 As the demolition continued, I realised that the gate happened to line up with the York Brewery building on Toft Green. In an earlier page I included a photo of Hudson House reflected in its windows. 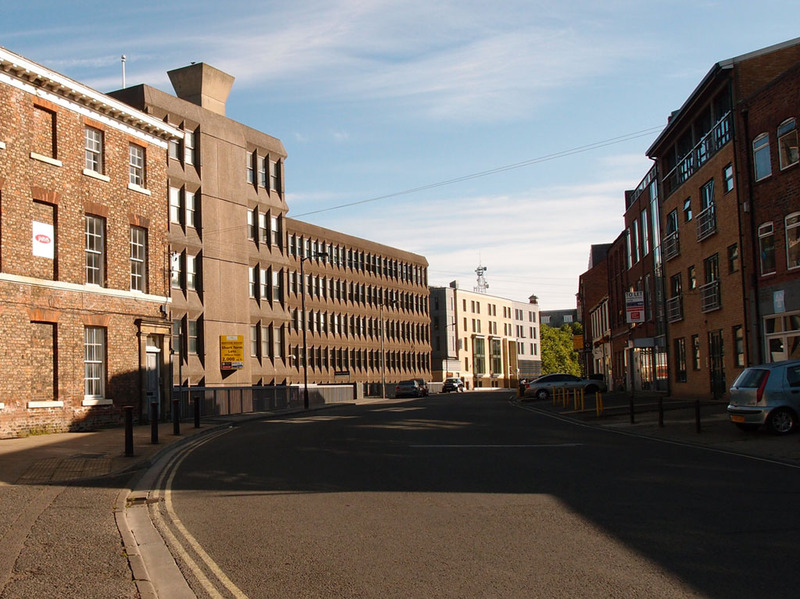 The York Brewery’s white-painted front became more visible, as Hudson House came down, in stages. Now Hudson House is gone it’s much clearer that ground level here is much lower, not just from the perspective of the city walls, but from the street of Toft Green, on the other side. The people and vans outside York Brewery on Toft Green are at street level, some metres above the ground level of the old station. Looking across here should perhaps make us think of the earth that was moved to make a railway station, in the first half of the 19th century, when that exciting new thing called the railway cut in through the landscape. It was thought so important that it carved its way right into the heart of the city, through the historic walls, cutting holes through them too. Many men and many hours of hard graft it would have taken to do this work, before the invention of the kind of machinery we have now. 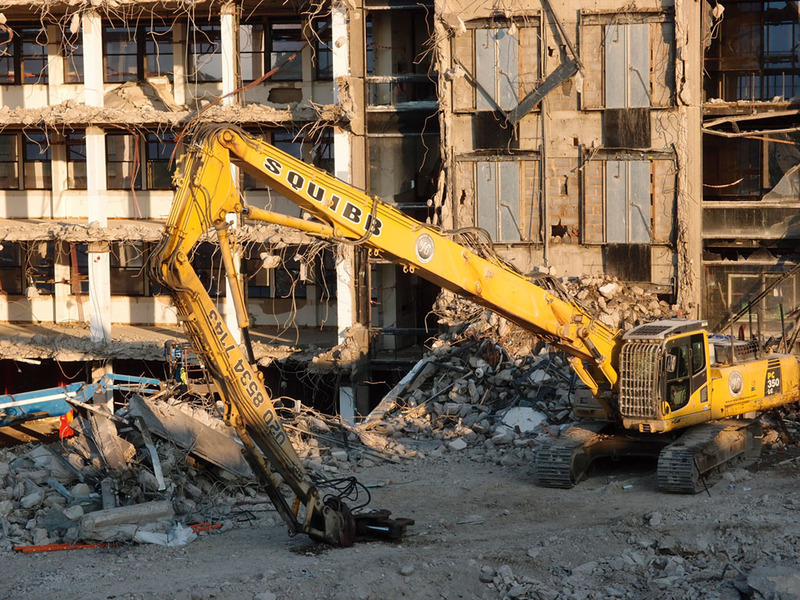 That 21st century demolition machinery was something to observe in itself. I’ve not watched these machines before, the way the heads can turn on different angles, like creatures grazing, taking bites out of the concrete. A man passing by while I was taking photos told his companion that they’re called ‘giraffes’. I can see why. Here’s one resting, after a busy day chomping on concrete. 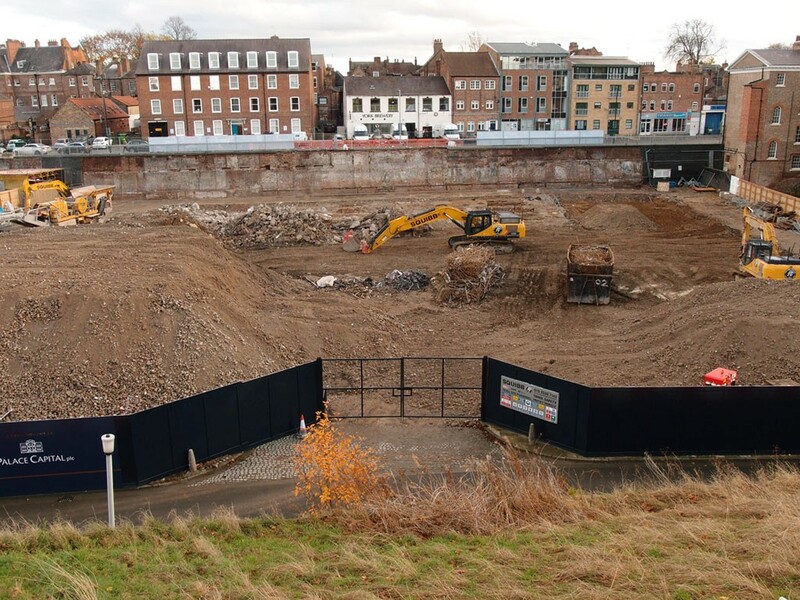 After looking at the demolition site from the vantage point of the city walls it made sense to descend from the walls at Micklegate Bar to have a look from the Toft Green side. While the work was taking place the site was screened so there was nothing much to see, but now the whole building has gone the change is quite dramatic. Quite a ‘gap’ there now on the left. There wasn’t much light available when I took the photo above, late in the afternoon on a November day, but what light there was will I imagine be reaching into neighbouring buildings in a way it hasn’t done for a long while, with Hudson House looming over things for the last 50 years. Soon, of course, new tall buildings will replace the old tall buildings. For now, in November 2018, looking down into the site from Toft Green, interesting remnants of what was below Hudson House are visible. Some archaeological investigation has been taking place here. I’d been wondering whether the new development to be built on the site would keep the name or change it. I noticed a while back that the old name had been removed from a sign just over the other side of the city walls, on nearby Queen Street. 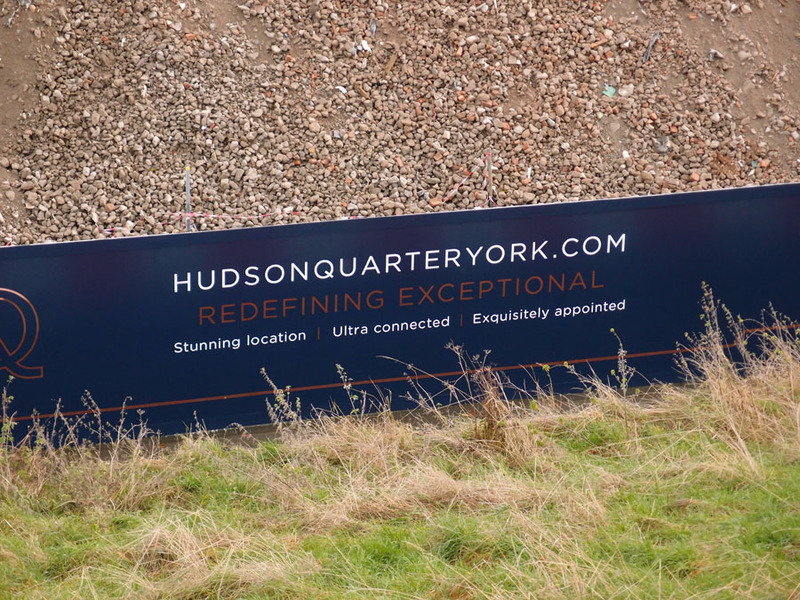 The new name is now prominent on the advertising hoardings around the site. The ‘Hudson Quarter’ is apparently going to include a new pedestrian access through from Toft Green to the station area. I’ll believe that when we can actually access it and find it goes from one useful place to another useful place. I hope that’s the case, but these things don’t always join up. 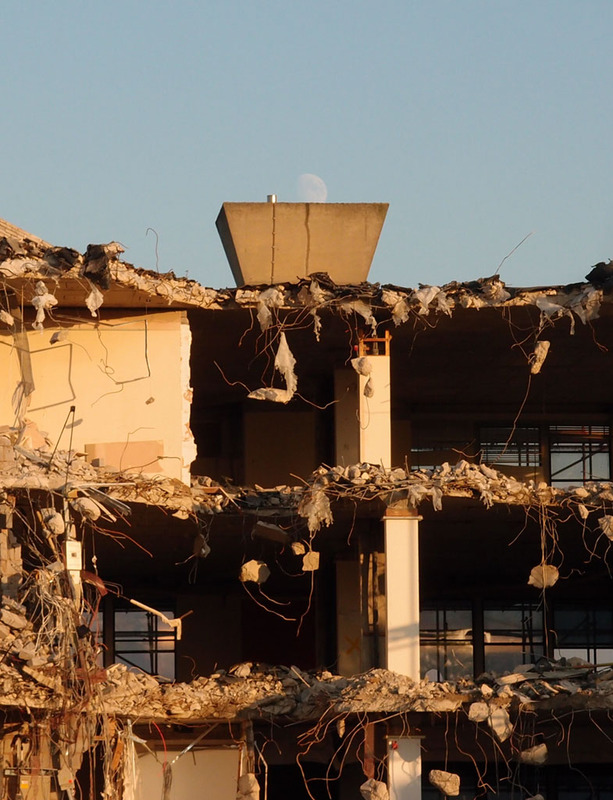 For now, I’ll end this page with a couple more photos of the end of that late 1960s building we knew as Hudson House. I have quite a lot of photos of its crumpled concrete. And later, pigeons, settled in the sun, at the end of the day, when the ‘giraffes’ were resting. My father, who died last year, worked in the railway offices nearby, and would have seen Hudson House being built. I was born at around the same time. 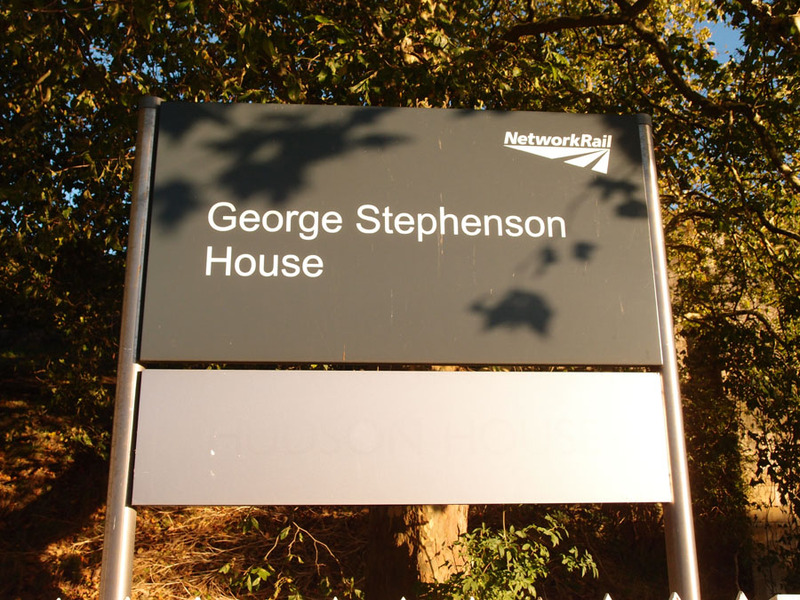 These British Rail offices on the site of the old station were part of my childhood and teenage years, and walking along the walls by Hudson House meant seeing so many people sitting at their desks, in that huge office block. It felt important, to me, to observe and photograph the end of Hudson House. I’m adding to these pages when I feel I have something original/interesting to add to the wealth of online content already available. It sometimes takes a while to properly cover things I’m interested in, as in this case. If you’d like notifications of new things appearing on this website, please join the mailing list. Looking at the archive reminds me that it’s seven years ago today that this personal website (online in some form since 2004) went blog-like (though I’ve never really liked the word ‘blog’). My first blog-like post was a scan of a photo of the floods in 1978. If you’d like to support what this 1960s-created weathered old structure known as ‘Lisa@YorkStories‘ has created and maintained online here at www.yorkstories.co.uk then virtual coffees are always welcome. 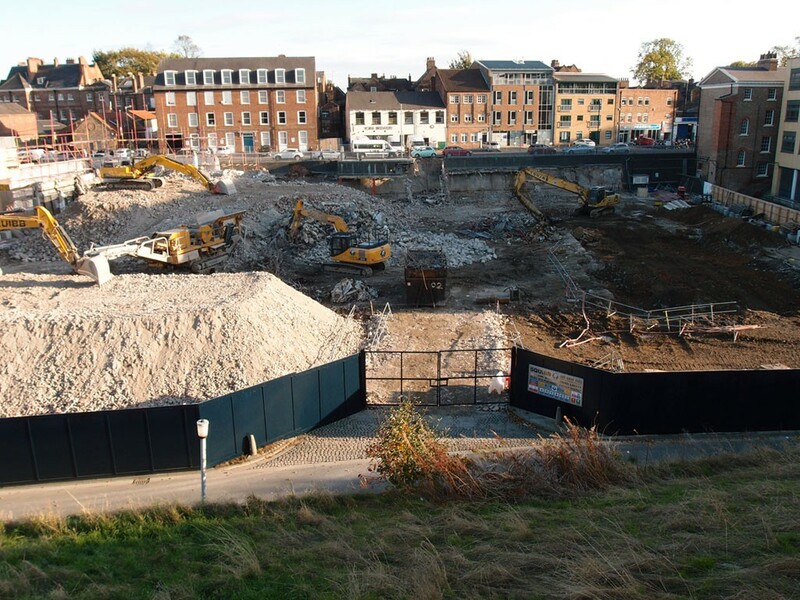 When the land was dug out to create the Victorian station, the remains of the Dominican Friary and what was left of the Roman baths beneath were removed and lost. Also demolished was the first Lady Hewley’s hospital, built in the early 18thC. With the purchase money the new almshouses were built in St Saviourgate where they still are. I was told once, that the removed soil and rubble was dumped behind the present station. Worked in Hudson House 3 times; 1980-1994, 2005-2010 and 2015-2017. 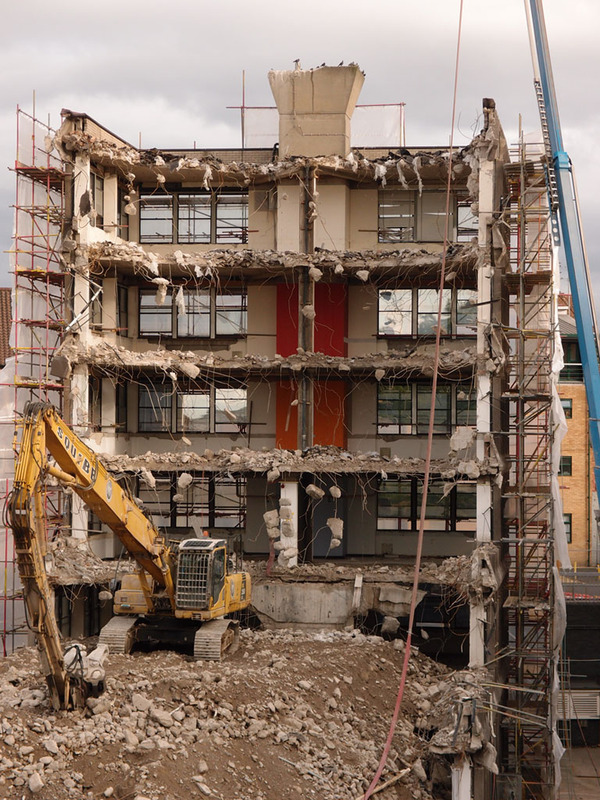 Very happy memories of what was really an awful concrete monstrosity, typical 1960s-clad panels that had a tendency to frequently crumble away!